Que: The capital of erstwhile Venad was ? Que: The king of Kozhikkodu popularly known as ? Que: "Mamankom" was celebrated at ? Que: The Father of modern Malalyalam Language ? Que: Lion of Kerala ? Que: Whose autobiography is called ''Ormayude Arakal ''? Que : Who was the founder of Nair Service Society (N.S.S) ? Que: Who is known as "Kerala Valmiki" ? KERALA has its own traditions and culture. Kerala is the most attracted tourist destination with its beaches, hill stations, backwaters, bird and wild life sanctuaries etc. Kerala is blessed with its variety of flora and fauna. Kerala festivals are attracting many tourists. 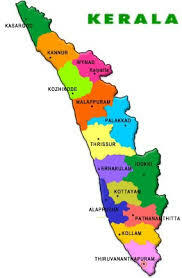 Kerala is the first 100% literate state in India. The Kerala cinema is always a symbol for quality movies. In literary field also Kerala is blessed with so many legends.